We Be HostiN's Frequently Asked Questions section contains questions and answers that we have received via email. Guides and screenshots are used as answers to better serve our customers. The following questions are commonly asked, and the answers may help you to better understand our services. Please contact us if you have any questions about our hosting services. Q: What is your uptime? A: Our web hosting servers are located in a data center in Chicago, IL. Game servers are hosted on quad-core AMD and Intel servers located in Dallas Texas, Kansas City Missouri, Chicago Illinois, Sofia Bulgaria, and Wilkes-Barre Pennsylvania. Virtual private servers are hosted on our Dallas TX and Wilkes-Barre PA hardware. Q: Do you own your server equipment? Q: How do I cancel a PayPal subscription to cancel my web hosting services? A: Please follow this YouTube video tutorial. It shows you step-by-step how to cancel subscriptions. Q: After I purchase a web hosting plan, what do I do? A: After paying, you should receive a welcome email within 24 hours containing your username, password, and other important account information. A: A new account will be setup within 24 hours. 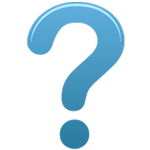 Q: How do I change my domain name servers? A: Each domain name registrar, or domain provider such as GoDaddy, has a different domain name control panel. Within your domain name control panel, there is an option to set or change your name servers to a custom address. Our name servers will be provided to you in the account information email we send out within 24 hours of payment. If you cannot find the name server settings within your domain control panel, please contact your domain registrar via their support. They will rectify the situation for you. We do not have control over any of your domains; we support only our hosting services. To change your name servers at GoDaddy.com, please follow this YouTube video tutorial. Q: What can I do if I am not completely satisfied with your hosting services? A: You may request technical support to see if we can address your issue, cancel your account, or receive a refund if you have purchased your hosting plan within the past seven days. Q: Do you provide an actual domain name, also known as a URL, with all accounts? A: No, we do not provide domain names as an addon to any of our hosting packages. A: We recommend you purchase your domains from Name Silo for only $8.99 per year. Q: Do you have a Facebook, Twitter, YouTube, and Google+ Plus account? 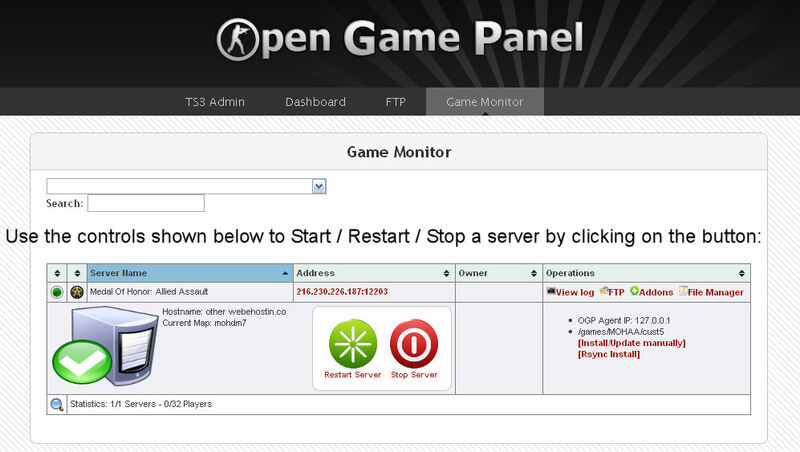 Q: How do we start, stop, and restart game servers using your control panel software? A: I've created an image guide showing you how to start and stop the server. It is a relatively easy process, but you must know where to click and what to click on. Click on the thumbnail images to enlarge. 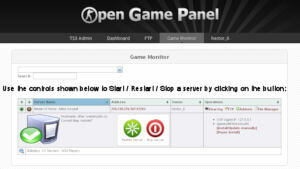 Q: How do we administrate, configure, and use our game servers? A: The following video introduces you to our game hosting service and contains guides that show how to use the control panel and transfer files using FTP.